Three standing nudes were carved in 1917 by a man in Eustis, FL. whose mother wouldn't allow the ladies in the house. The ladies were put in storage until Mom "met her maker." 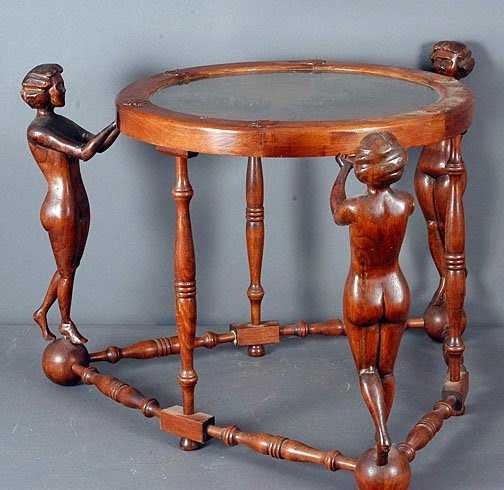 The table was made in 1960 and the ladies were added. Three carved wooden nudes - carved grapes under to top. 21"t x 30"l. The Table was exhibited at the Florida State Fair at which it won an award. Sold for $1,400.00 (w/o premium) at Slotin, February 24, 2007.